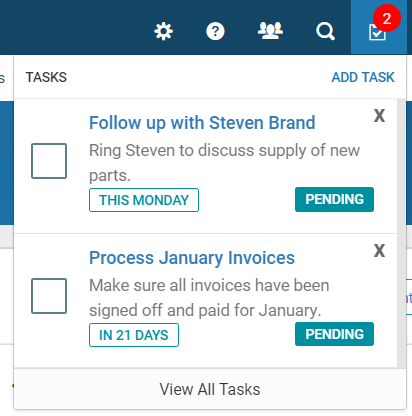 In addition to assigning a task list to a contact you are now able to create a specific ‘to do’ task lists for your yourself. Tasks are an easy way to create a date specific ‘to do’ list ensuring you never miss an important meeting, call or activity based on your specific businesses requirements. 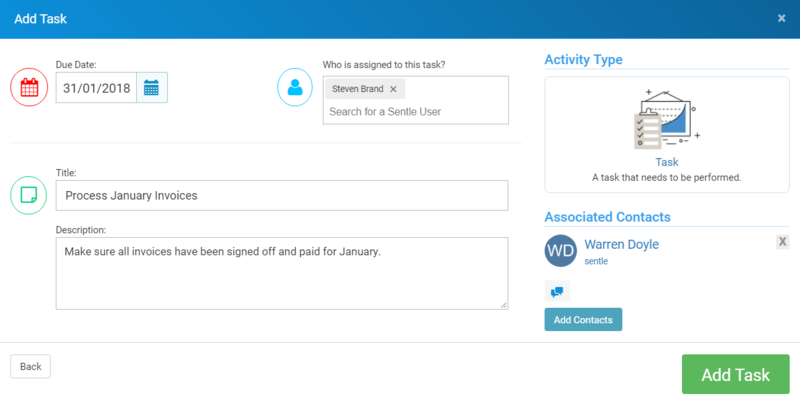 There are a few ways in which you can add a new task to Sentle as shown below. Clicking into a date within the calendar or by using the green ‘Add Task’ button to from the other areas will see the following screen appear. While on this screen you able to do the following. Select Due Date: Click on the date or calendar icon next to it to load the date picker and select the date by which this task is due. 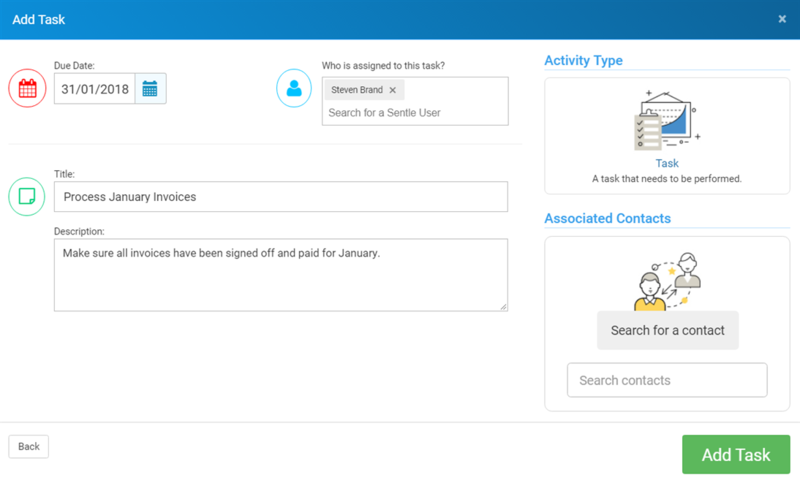 Assign Sentle User to Task: By default, you will be selected as the owner of the task meaning that it will only be displayed on your dashboard when you are logged into the system. If you wish to add one of your colleagues to the task simply start typing their name in the search box and select them when they appear. Note: You can remove yourself from a task if you are setting it up for somebody else and do not wish to see it on your dashboard. Task Title and Description: The Title and Description will be displayed in the dashboard and tasks area giving you a quick snapshot as to what the task is. Note: You can’t add a task to Sentle until you’ve given it a title. The green ‘Add Task’ button will only appear when you’ve added the Title. 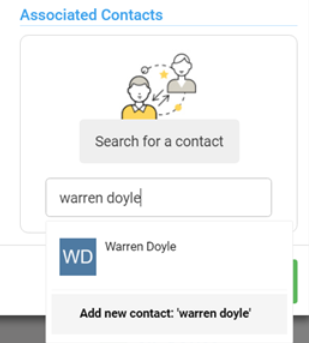 Adding Contacts to Tasks: If you wish to associate a task with one your contacts within your system to can do so by typing their name in the ‘search for a contact’ box. When a contact has been added to a task their details will be added to the form as shown below. You are able at this point to alert the contact via text that the task has been scheduled. If you do not wish to alert the contact uncheck the ‘alert contact’ box. Tasks will not send messages by default but can be switched on in the calendar configuration area.